Discuss 3 ways inertia can be used to alter intensity in aquatic choreography. Identify the 3 axes, 4 planes, and 3 points for movement. Discuss the 4 qualities of multi-dimentional movement used to create aquatic choreography. Explain the 7 parts of the SWEAT-Formula for creating variety in aquatic choreography. Explain how to safely and effectively perform 6 basic arm moves, 3 arm combinations, 6 SWEAT-Formula move variations, and 16 combinations for shallow water. 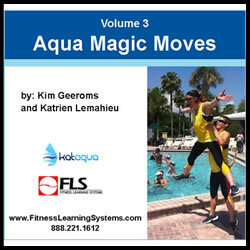 Explain how to safely and effectively perform 6 arm moves, 2 basic positions, 5 basic leg moves, 4 basic move options, 5 SWEAT-Formula move variations, and 2 combinations for deep water.